I have been wanting to get more of these guys made up. This is one of my patterns in my Craftsy shop. 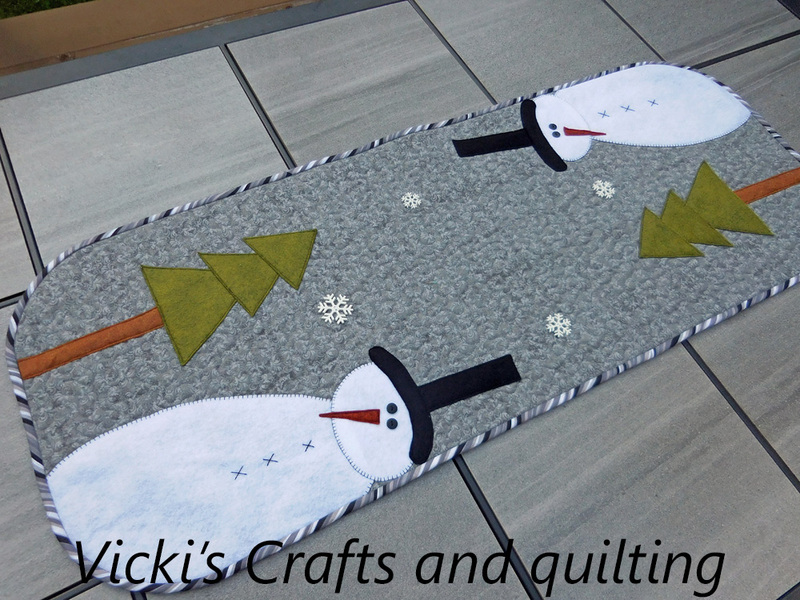 This 16" x 40" table runner is very quick to make up. The quilting is done and then you shape the rounded corners and applique the snowmen and trees on. Add some snowflake buttons and round black buttons for his eyes and you are ready to bind and enjoy this winter! I love the striped gray/black/white binding which I had to cut on the bias to go around the curve. Since I was quilting yardage it was just as easy to whip up 2 of them at the same time. Love those trees! You make the cutest table runners! This one is new to me, and of course I love it! Those snowmen are too cute, and I like the little trees! You are the Queen of Adorable Table runner makers! I love the bias stripey binding. It is the perfect finish for this darling runner. Those are so cute, Vicki! I love the rounded edges. I use to always make bias binding, but now I haven't for a long time. I'd have to youtube that! Ha ha, what Ramona said! You're definitely the Queen :) That gray stripe on the bias makes a fantastic binding, but my favorite part is how you use the little snowflake buttons. So cute! Oh too cute. 2 are as easy as 1! Sweet tablerunner!! I love snowpeople! So adorable...will post on my facebook page. Love your runners, so cute! It's mid-September and you just finished some winter projects?! You're my hero! Your snowmen are super-sweet. And those snowflake buttons? Brilliant! You are so into winter right now - you go girl! These guys look great! What a great two-fer! I love this technique of quilting the fabric and then adding the appliqué. The striped binding is a fabulous touch! I like how your snowman is looking out from the corner of the quilt instead of having background all around. So whimsical! Oh these guys are cute! I love the rounded corners. Love how the binding hugs the snowman's curves!